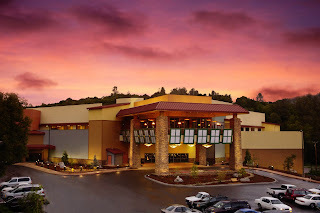 The Black Oak Casino is located in eight miles east of Sonora in Tuolomne in Central California, within easy distance of Yosemite. The casino is run by the Tuolomne Band of Me-Wuk (Miwok, Miwuk, Mi-Wuk) Indians. 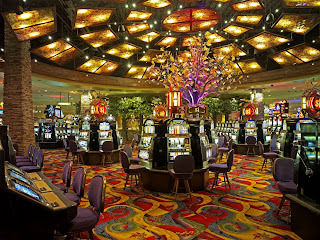 The Black Oak is your typical casino with a players club, a number of restaurants, live music, and a gift shop, as well as family-oriented activities in the form of a bowling alley and an arcade. Unlike some destination casinos, the Black Oak doesn't have a hotel. However, there are a number of places to stay in surrounding communities. The Black Oak also has a smoke-free bar and casino area. The casino is open 24 hours. I have been to the Black Oak a couple of times. I'm not that big into gambling, but find it a pleasant way to pass a few hours. Since the casino doesn't close, it's a good place to go after some of the other area attractions are closed or when it's too dark to do any outside activities. The casino features four places to dine and two bars. The restaurants range from the Kingpins family eatery to the Seven Sisters fine dining restaurant. I've eaten at the 24-hour Black Oak Cafe several times and have never been disappointed with the quality of the food. I have ordered off the menu each time, although they do feature a different themed buffet daily. My boyfriend got the prime rib buffet on one visit and said it was the worst prime rib he'd ever had (somehow it tasted like ham); so, you may want to avoid this particular buffet item. I can, however, vouch for the tastiness of the veggie sandwich, which is a portobella mushroom instead of the ubiquitous veggie burger. As with most casinos that allow smoking, the casino air is permeated with the heavy stench of cigarettes. The more crowded the casino is, the more unbearable the atmosphere. However, if you don't mind the smoke, then you won't be bothered. The smoke-free portion of the casino is small in comparison with the rest of the casino (which you have to walk through to get to the smoke-free room), however, it does have several different types of games--mostly slots--to keep you occupied. The nice thing about the smoke-free room is that it has its own bar, so you don't need to venture into the smoke cloud in order to get a drink. A Casino Online is a web facility that accommodates certain types of gambling and entertainment. You can also visit this Casino Online during your boredom hours. It can feel you relaxed and extracts overwhelming. Great! I am sure that gambling is one of the best things ever. The best thing to get reach and relax. But of course you need to read guides http://realcuriousworld.com/ first, or you can lose.